Become a Dork Diaries Superfan!! My Parents Won’t Let Me Use Social Media Like My Friends! I know a lot of friends with social media accounts on Twitter and Instagram. But, whenever I beg my parents for a social media account of my own, they always say no. Why won’t they let me have one and how do I get them to change their minds? I totally get your misery! My parents let me do some social media, but they didn’t for a long time. And I really felt like I was missing out! I always felt like “everyone else” was on social media having a big party without me. It’s never fun to feel left out, whether you didn’t get invited to a sleepover or you couldn’t comment on a funny picture. To help you understand why your parents won’t allow you to have a social media account, let’s talk about the other side for a sec. First, you actually have to be 13 to have an account with Facebook, Instagram, Pinterest, Tumblr, Reddit, and Snapchat. Like, according to the thing you sign when you say you’ve read the “terms of service.” So if you’re 13 or over, you can ignore this next part. But if you’re under 13, your parents would have to break a law meant to keep kids safe online. Sure, plenty of kids under 13 have accounts, but only because they’ve lied or their parents have lied in setting up accounts. So your parents may have strongly held morals that are admirable (even though they’re totally frustrating). It may not be about age, though. Your parents might be worried about social media becoming a big distraction that takes time away from your family or your schoolwork. They might be worried about cyber-bullying, and that’s no joke! Kids deal with serious depression over things like who un-friended them or posted secrets about them for everyone to see. Your parents also might be worried about internet stalkers, or people who keep pestering you and take all the fun out of the social media experience. These are all understandable concerns for your parents to have. On any acceptable social network you sign up for, your parents should be your first friend. This will allow them to keep an eye on your interactions with others. If there’s anything you wouldn’t be comfortable having your parents read, you probably shouldn’t be posting it on social media. Go over the account settings together and be sure your accounts are always set to the strictest privacy settings and are only visible to friends you’ve approved together. Use filtering software like Net Nanny or PureSight PC, which would let your parents keep an eye on your social media activity without hovering over your shoulder. Keep your computer in a central location. 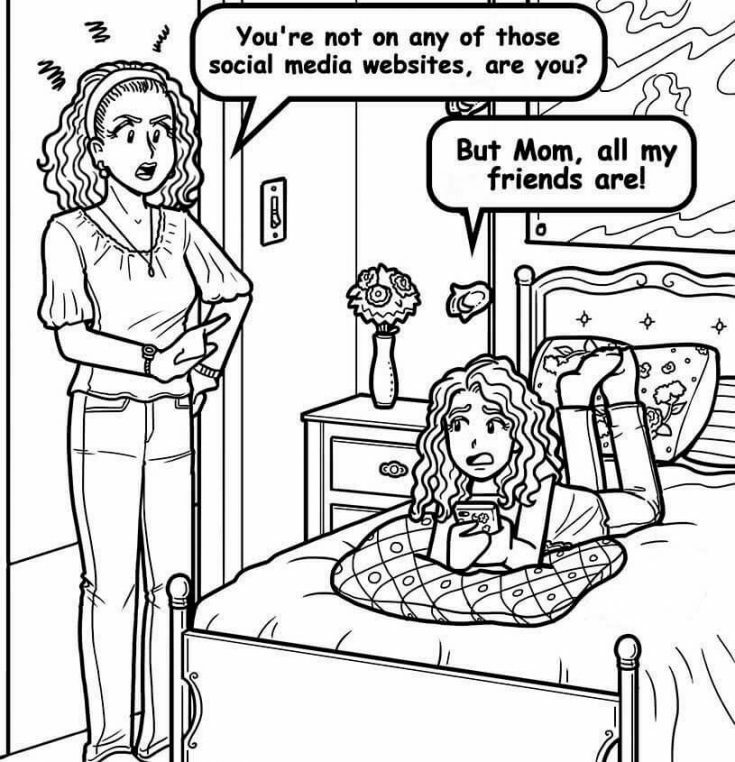 Your parents will worry more if you’re doing all your social media activity alone in your room. If the computer is in the kitchen or living room, they’ll worry less. Only use social networks during certain hours, or after homework is completed. Finally, even if your parents aren’t comfortable with sites like Instagram or Facebook, there are also some kid-friendly places to be social online! For one thing, this very Dork Diaries website has lots of room in the comments for interaction and if you hang around, you’ll start to get to know people. And you’ll all have in common that you love Dork Diaries! There are also apps like GeckoLife and PopJam, which are designed for kids. What do you guys think? What advice do you have for Social Media Misery? Tell us in the comments! It’s fine dude ….m 13 and my parents have still not given it to me . All my frnds have Instagram and everything but I don’t . I totally understand u . Just ask once in a month or so about your account and if they still don’t allow then just wait until they are ready to give it you . Yeah, I get the struggle. It took FOR.EVER. to convince my parents to let me get TikTok! They won’t let me get anything else but that so I just hide them in the back of my phone. I don’t suggest doing that, but I suggest writing a little note to your parents on why you should get social media. Make sure to have good points! Also, just feel grateful that you have a phone! There are plenty of kids that don’t. wow тнaт waѕ ѕo υnғaιr! Social media can be a very scary place, and on top of that…it can consume literally all of your time which could be spent on more other hobbies like drawing or spending time outside! I VERY MUCH agree with Nikki Maxwell! Oh i love social media! My favorites are Insta, Tumblr, and of couse- TIK TOK!!!!!! This is why I don’t have a phone. I want to use social media too, but my parents won’t let me. Instead you can do what Nikki said and do other things like drawing or playing. Social media isn’t my thing, it’s not private enough for me and my family. Hackers? Oh, a big NO NO. I’m not allowed social media, so I connect to my friends through email. Social Media Misery, do you just want to connect with your friends and be cool like them? If so, don’t. Be yourself and people will love you. Don’t change yourself to become someone who you aren’t. My friend is a huge copycat who copies, like, everyone. I’m telling you it’s SUPER annoying so don’t try to copy your friends to be cool. It stinks. But if you REALLY want social media, not just to be ‘cool’, then try to convince your parents. The worst can say is no, but if they say that, just shake it off and connect to friends with email/text. Hope this helped! my parents are like really “nuts” about these things they say NO NO NO! I wish I could use social media too, but I’m kind of glad my parents haven’t let me. I mean, I may be considered a dork and an outcast, but hey, at least I still have my innocence. And look on the bright side, there is so much more to life than social media! I mean, I don’t think I would’ve gotten this far in life (I mean, I’m already writing two book series and I’m only in middle school!) if I had become another social media addict. Its ok there are other things to do! you might get an account if your parents get 1 too. My parents have a facebook account and they won’t let me get one! And I’m 16! I extremely agree with Nikki.Your such a great adviser! Keep up the excellent work,Nikki! Parents are SOOOOO weird!!!!!! I deal with that EVERY DAY!!!! But they are doing this to protect you, it’s not like they want to do this. they want bestttt thingsss for you, so don’t say that. If you understand them more, they will be like… your second-best-friend?!!! That will be better. Don’t say that they’re weird. Why not try FamiSafe? It is an app designed to prevent online predators, etc. Freaking out about a problem? Freaking out about a crush problem? Major drama in school? Bratty little sister driving you crazy? No worries! I’m here to help! Tell me what’s up and I’ll give you the best advice I can. Just ask Chloe and Zoey…I’m awesome at giving advice!! I’ll try to answer a question each week, depending on how much homework I have! Get the boy side of things!